We are dedicated to prompt legal action on your matter. We will respond immediately to your call for action. We have the man and womanpower to promptly move your case along. We provide open communication and quick resolution, and we offer our legal services at a reasonable fee. The firm has invested heavily in the most up-to-date computer technology. We use the latest scanning technology so that all legal documents can be converted to PDF and quickly sent to all parties in a transaction, and we have recently set up a portal where all your documents can be posted and viewed online. This allows us to move each case forward as quickly and efficiently as possible while passing the savings along to our clients. MarcianoLaw is known for its expeditious manner when handling cases. Attorney review letters are prepared in one day. Divorces are filed within one week. Corporations can be created within one day. One of the guiding principles when dealing with client matters is to always know what is next so that we can move a case forward to its completion as quickly as possible. This is what sets MarcianoLaw apart from other firms. One of the first things that you will notice when coming to our law firm is that there aren't big piles of paper scattered everywhere. All legal documents pertaining to your case are filed under your name where they can be easily found. We don't waste anytime when it comes to resolving your case. Having a lawyer that is experienced in your legal matter is very important. 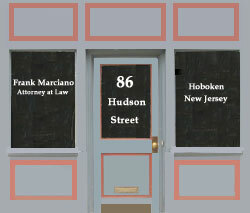 It is just as important to have an attorney who is familiar with Hoboken and the surrounding areas. Frank knows the people and the places of Hoboken, and when you retain his services, you are buying that experience and knowledge. His law firm has been located on 86 Hudson for more than 20 years, and it will be there for years to come. Frank has represented thousands of people in many different legal matters. To learn more about the kinds of clients that he represents, please click here.